Why Do Some Otherwise Decent Bible Students Now Reject the Bible Teaching that Satan Has Children on This Earth? Steve, it seems to me there’s a growing number of Bible students who used to believe in the Biblical teaching that Satan has children on this earth through his seduction of Eve in the Garden of Eden which resulted in the birth of Cain, but now reject that teaching. In other words, these students have reverted back to the church tradition that Eve merely “ate an apple” or “was deceived,” claiming there was no physical (i.e, sexual), seduction in the Garden of Eden. Some of these students also now claim that when the Bible speaks of two “seed lines” you have to take it spiritually, and not physically. In other words, they claim the “good seed” spoken of in Christi’s parable of the tares in Matthew 13 are simply “good Christians,” and the “bad seed” are simply non-Christians. There are no children of the devil, at all, in their eyes. Finally, they claim that when Christ was talking to the Jewish religious leaders in John chapter 8, He admitted they were of Abrahamic heritage, and therefore they could not have been of the seed line of Satan. Do you have any words of advice how to reach these people? As you know, no one can give people “eyes to see, and ears to hear.” Only God can do that. And even then, each person has to choose whether or not they like having the spiritual blinders off their eyes. In some cases, people find they don’t like having the blinders removed from their eyes, because of the controversy caused when they try to explain their newfound understanding of God’s Word to friends, family members or fellow Christians. Operating outside of widely accepted church tradition (such as the “Eve ate an apple” tradition) makes some people feel alone. It frightens them, because failing to go along with church tradition sets them apart as being “different” than the rest, and they’ve probably striven all of their lives to fit in with the rest. 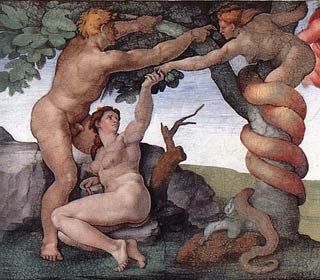 In other words, at first, when a person hears one of the deeper truths of God’s Word — such as the serpent’s sexual seduction of Eve in the Garden and the resulting birth of Cain — he or she might instantly rejoice in it, because it answers so many questions about the origin of evil in the world and its ongoing effects. It thrills them, for a short while, to learn the truth. But then they try to tell friends, family members or fellow Christians what they’ve learned, and very quickly tribulation and persecution sets in (i.e., “by and by he is offended”). That means they’re chastised and maybe even ostracized for believing God’s Word and rejecting church tradition. So they’re stumbled in their newfound understanding of God’s Word. They’re told “Eve ate an apple” and if you believe anything else, you’re a heretic. You’re not welcome. So their joy in learning the truth lasts only for a very short time. As soon as they’re challenged over what they’ve learned, they cave in and go straight back to church tradition in order to avoid being ostracized or marginalized by their friends, family or fellow Christians. In other words, the individual can’t endure the criticism or opposition of others. So he doesn’t last long in the truth. In some cases, the truth may have initially made sense to him, but he didn’t follow through and study it with any degree of discipline. So when family members, friends or fellow Christians react negatively, the individual isn’t Biblically literate enough to defend the truth he’s learned, because he has no depth of understanding. So he reverts back to church tradition in order to be accepted. But the reality is this: They can’t handle the truth. They can’t handle standing firmly against empty church traditions like “Eve at an apple” because all of their Christian friends and family believe the apple story, even though the word “apple” appears nowhere in the book of Genesis. Christ is doing the speaking in that verse. And basically He’s saying some people willingly close their own eyes and ears to the deeper truths of God’s Word because it’s just too much for them to handle. They’d rather have the very temporary pleasure of being accepted by others than the eternal spiritual conversion and healing that’s brought about by a mature understanding of God’s Word. They take solace in remaining firmly rooted in church tradition with all of their spiritually blind friends. Being “accepted” by others is more important to them than standing firm in God’s Word and being accepted by Him for overcoming the deception that’s now so rampant in the churches. I’ll never forget driving home one night from work, about six months after I started studying the Bible with Shepherd’s Chapel (this was 30 years ago, now), and a radio program called The Bible Answer Man came on the car radio. The guy was railing against teachers who taught what he called “that abominable serpent seed doctrine.” He laid out the usual arguments against their being a Biblical “serpent seed,” meaning physical children of the devil on this earth through Satan’s seduction of Eve resulting in the birth of Cain. And of course, when you’re relatively new to the deeper truths of God’s Word, and you hear the arguments being laid out by a guy who’s supposed to be a “Bible Answer Man,” they seem really convincing and tend to engender doubt. So I went home quite shaken. I John 3:12 — Not as Cain, who was OF that wicked one, and slew his brother. And wherefore slew he him? Because his own works were evil, and his brother’s righteous. In other words, Cain wasn’t just “of” the devil, as if being a member of some devil cult. Instead, he originated from the devil. He was “out from the interior” of the devil. He was the devil’s son, through Eve. I also reminded myself that when our Lord spoke the words in John 8:44 to the Jewish religious leaders, “Ye are of your father the devil, and the lusts of your father ye will do,” He used that very same word ek. He might as well have said “Ye are out from the interior of your father the devil,” because that’s what the word means, compared to the usual New Testament words typically translated “of,” such as hupo, or para or occasionally apo and several others. In both cases (and in every single case in the “beget” verses in that chapter) the word “of” is translated from the Greek word ek, meaning “out from the interior of” and not from the usual Greek words translated “of,” such as hupo, para and apo. I believe it’s important to note that fact, because the subject matter in Mathew chapter one is birth origin. In other words, each person in the lineage of Christ was “out from the interior of” (i.e., ek) the previous person in the lineage. Finally, in Matthew 1:16 we see “And Jacob begat Joseph the husband of Mary, of whom was born Jesus, who is called Christ.” There, the word “of” once again being translated from ek, meaning Christ was born “out from the interior” of Mary. It’s also the same word used in Matthew 1:20, where the angel Gabriel is telling Mary’s husband-to-be, Joseph, that the child being carried in Mary’s womb is “of” the Holy Ghost (i.e., ek, out from the interior of the Holy Ghost). My point is that Bible students simply assume the use of the word “of” in the New Testament is translated from the same Greek word every time, and carries the same meaning every time. But it’s not. When the word “of” is translated from the Greek word ek, it’s meaning almost always points to the actual physical origin of a thing. But when the word “of” is translated from the Greek word apo, it means from the surface of a thing. When the word “of” is translated from the Greek word para, it means alongside of a thing. And when the word “of” is translated from the Greek word hupo it refers to the underside of a thing. It’s well worth reading Dr. Bullinger’s Appendix 104 in the Companion Bible, where he explains the different Greek words translated “of” in the New Testament, and their various nuances. Dr. Bullinger even includes a drawing, showing how the Greek word apo denotes movement from the surface of an object, whereas the Greek word para means to be alongside an object. But the Greek word ek means to come from the interior of an object. Dr. Bullinger writes, “Ek marks the more immediate origin, while apo marks the more remote origin.” In other words, I am “of” (ek) my mother, Bettie. But I am also “of” (apo) the United States of America. The first is my immediate origin, i.e., where I actually originated from. The latter is my more remote origin, i.e., where I ended up after I was born. And that’s what “rightly dividing the Word of truth” (II Timothy 2:15) is all about. You have to look at the words being used in the translation, note carefully where words change, and understand what those word changes mean, because they’re always significant. The bottom line is that the New Testament tells us that Cain was “of” (i.e., out from the interior of) the wicked one, meaning Satan, and so were the Jewish religious leaders who Christ was constantly chastising. Jesus states clearly that the Jewish religious leaders “are Abraham’s seed.” In other words, they’ve got legitimate genealogical descent from Abraham. But note that He also tells them they’re plotting to kill Him. And why? Because His words have “no place” in them. The phrase “no place” is translated from two Greek words, choreo and ou (see Strong’s G-5562 and G-3756, respectively), which, together, means “absolutely no space whatsoever.” In other words, there’s no place in them at all for God’s Word. The Jewish religious leaders continued to insist that Abraham was their father. In other words, they’re claiming a direct lineage from Abraham. But Christ now refutes that by telling them their actions don’t meet their claimed heritage. When He says “If ye were Abraham’s children you would do the works of Abraham,” He’s invoking the “life father, like son” principle. He’s saying, in essence, if you were Abraham’s kids, you’d be more like Abraham. Again, Christ is bringing up the principle of “like father, like son.” Abraham never tried to kill anyone for telling the truth. Yet these Jewish religious leaders who claimed to be of Abrahamic heritage, and of Abrahamic spiritual belief, were plotting to kill Christ for no reason except that He was telling people the truth. And that truth was driving people out of the churches (synagogues), which is where the Jewish religious leaders made their money. So hatred of Christ was building up inside of them, not because He had done anything wrong, but instead, because He was cutting into their payday by teaching God’s children truths that contradicted the religious traditions being taught in the synagogues. Christ pointedly tells them “You do the deeds of your father,” meaning they were of a completely different genealogical bloodline than He was. Christ was clearly of pure Abrahamic decent, as spelled out in the genealogy given in Matthew chapter 1. But he’s telling these Jewish religious leaders that while they might have Abrahamic blood in them, their origin — which is to say, their original birth father — is different than His. In other words, they got defensive with Jesus, and stated they were not descendants of the fornication that took place between Eve and Satan in the Garden of Eden, which is the most famous and well-known fornication in the entire Bible. That alone is a tacit admission by these Jewish religious leaders that they understood what happened in the Garden between the serpent (i.e., Satan), and Eve, which brought about the resulting birth of Cain, the serpent’s child. This is further borne out by the fact that Cain is listed nowhere in Adam’s genealogy in Genesis chapter 5, i.e., because he was not Adam’s son, but instead, the serpent’s. So the Jewish religious leaders were looking Christ in the eyes and claiming they’re not part of that Satanic bloodline at all. Why would Jesus say such a thing? Because if God were indeed their father, that would have made these Jewish religious leaders brothers to Christ. And true brothers love each other. Christ is now bringing it down to where the rubber meets the road. The previous topic was whether or not they were children of Abraham. But the topic has now shifted to whether or not they were of God’s original creation in that Garden, or of the seduction that took place afterwards when Satan seduced Eve. And Christ basically tells them they aren’t of God at all, and that their actions prove it. This is why Christ would say in Matthew 7:20 and other places, “Wherefore by their fruits ye shall know them,” with fruits referring to the actions or deeds of the individuals. So the key to understanding these verses is that the ancestors of these Jewish religious leaders had co-mingled, sexually, with descendants of Abraham down through history, and thus could legitimately claim to be of Abrahamic descent. Christ admitted they were. But in reality, at their very origin, they were sired by that old serpent, the devil, in the Garden of Eden. And Christ let them know that, as well. They simply can’t hear God’s Word with understanding because they’re of that hybrid bloodline that started in the Garden with the sin between Eve and Satan that old serpent, which brought about the birth of Cain. In other words, Satan is the original father of these Jewish religious leaders, and the originator of all deception, right from the very beginning, starting in the Garden of Eden itself. Yes, if they act like Abraham, who loved God, and who looked forward to God’s Messiah, then they clearly have the spirit of God flowing through their blood. But on the other hand, if they act like murderous Cain, by having murder in their hearts against Christ just as Cain had murder in his heart against Abel, then they have that spirit of their father, Satan, flowing through their blood. This is why Christ would twice state, in the great book of Revelation, that He knows the blasphemy of those who “say they are Jews, but are not, and do lie” (Revelation 2:9 and 3:9). They blaspheme God’s Word by rejecting and ultimately murdering His Messiah, Jesus Christ, just as Cain rejected and ultimately murdered righteous Abel. Finally, it’s beyond me why some of these “serpent seed” skeptics can’t understand that while Matthew 13:24-30 — the parable of the tares — is a parable being told by Christ, Matthew 13:36-43 is quite different. It’s Christ’s crystal clear explanation of the parable He had just told. In this world there are “good seed” (i.e., good sperma) and there are the “tares,” which are “the children of the wicked one” and which were sowed into this earth (through the seduction in the Garden) by the devil himself. In other words, according to God Himself in Genesis 3:15, the serpent has seed on this earth (through Eve), and the woman has seed on this earth (through Adam). And the two seed lines would be at “enmity” (i.e., chronic hostility) with each other throughout history. That’s why the Jewish religious leaders were so hostile to Christ. Christ was of pure blood from Eve to Mary. But while the Jewish religious leaders did indeed have some Abrahamic blood in them, genealogically speaking, their actual, physical bloodline origin was the serpent in the Garden of Eden. They were the descendants of Cain. There’s a gentleman who teaches Bible study, online, and who used to be a Shepherd’s Chapel student but apparently no longer is. Several years ago this gentleman suddenly started teaching that the “serpent seed” doctrine was incorrect, and that there are simply believers and non-believers in the world, and that the believers are the spiritual “seed” of God while the non-believers are the spiritual “seed” of the devil, etc. But, he claims, there are no biological children of the devil at all in existence, anywhere, and never have been. In essence this gentleman now teaches that the parable of the tares in Matthew 13 is simply a parable of “opposing spiritual offspring,” i.e., Christians are the “good seed” and everyone else is the bad seed, which is to say, the tares that sprang from bad seed. I listened to one of this fellow’s studies on this topic five or six months ago, and couldn’t believe how he never even mentioned Christ’s explanation of the parable of the tares in Matthew 13:36-43, but instead focused on the parable of the sower that occurs before the parable of the tares in Matthew 13. He tried to relate Christ’s parable of the sower directly to Christ’s parable of the tares, claiming that in the parable of the sower the “seed” being spread on the ground is clearly representative of God’s Word. Therefore, he claims, in the parable of the tares, the “seed” spoken of there must also be representative of God’s Word and has nothing to do with physical offspring. But once again, there’s a failure to check the Greek words from which the two parables — i.e., the parable of the sower, and the parable of the tares — were translated. The word “seed” used by Christ in the parable of the sower is a completely different Greek word than the word “seed” used by Christ in the parable of the tares. Yes, this gentleman never mentioned that in the parable of the sower Christ always used the Greek word speiro for “seed” (because speiro means to scatter something, as if sowing seed over a plot of ground), whereas in the parable of the tares (Matthew 13:36-43) Christ immediately switched from using the Greek word speiro for “seed,” to using the Greek word sperma (i.e., meaning “male sperm”) instead. This change in words clearly indicate a distinct change of subject matter between the parable of the sower and the parable of the tares. Break out your Strong’s Concordance and compare the use of the word “seed” in Matthew 13:23 (i.e., speiro) which is the last verse of Christ’s parable of the sower. You’ll see the same word (speiro) is used by Christ for “seed” throughout the entire parable of the sower. It never changes. But as soon as you move into Christ’s parable of the tares in Matthew 13:24, the word for “seed” suddenly switches to sperma (meaning male sperm). Likewise, in Christ’s very clear explanation of the parable of the tares in Matthew 13:36-43, Christ continued using the Greek word sperma. So He’s clearly talking about physical human “seed” which is to say, sperm. The Bible teacher I’m talking about never mentions any of this. He just acts like it doesn’t exist. It’s as if God took the blinders off of his eyes many years ago, allowing him to “see” the truth for short awhile, but then this teacher chose to put the blinders back on and is now teaching his students to do the same thing. I think that particular online Bible study ministry is where a lot of the confusion is coming from among some of these current and former Shepherd’s Chapel Bible students who are suddenly disavowing the Bible’s very clear teaching that Eve was seduced by the serpent in the Garden and the result of that seduction was the birth of Cain, the first murderer. In the verse above, the term “first principles” means the “beginning order.” In other words, St. Paul is telling the Hebrews you’ve got to go all of the way back to the book of Genesis, where everything started, and understand it, or you won’t understand the rest of the Bible. That’s what “the first principles of the oracles of God” means. St. Paul is telling the Hebrews they need to be taught these “first principles” all over again, because apparently they’d abandoned the teaching. Paul tells these Christians that just as a bottle-fed baby is unskilled in all things in life, so they, from a spiritual perspective, have become “unskilled in the word of righteousness.” In other words, they’re spiritually immature. They’re like little babies who can only subsist on milk. And there’s the key: As Christians we have to mature in God’s Word by diligently studying it and rightly dividing it. And we have to cast aside the church doctrines (i.e., milk) that are designed to protect little children from unsavory subject matters like seduction (such as the “Eve at an apple” teaching that originated so children wouldn’t have to hear about the serpent’s seduction of Eve), and take God’s Word like a grown-up, i.e., with grown-up understanding. But many Christians still can’t do that. While they might have been going to church for their entire lives, as adults they’re still operating in a state of spiritual arrested development because they’re so steeped in the empty church tradition they still can’t “hear” (i.e., understand) the deeper truths of God’s Word that are reserved for the mature. They’d rather simplify the Bible into two child-like categories, i.e., “good people v/s bad people,” or “believers v/s non-believers,” and ignore the deeper truths God reserves for those who “are of full age” (i.e., mature in the Word) and “have their senses exercised to discern both good and evil” (i.e., they “get it” when His Word says the devil has children on this earth, and then reveals precisely who those children are and how the evil of this world proceeds forth from them). There’s a great threshing taking place among Christians today. And it’s sorting out those who truly study God’s Word and rightly divide it, from those who take the softer, easier way of ignoring God’s Word and instead sit in church pews on Sundays to hear empty church traditions being preached over and over and over again. It’s sad. But at the same time, I suppose it’s quite necessary. As you know from many different Scriptures, such as the story of Gideon and his troops, God often whittles down the number of His warriors just before He sends them into battle. Satan will be here soon, on this earth, in his role as the substitute Messiah, a.k.a. the antichrist, or instead-of-Christ. And God’s elect will have to take a firm stand against him until Jesus Christ arrives. For those who might like to learn more about the seduction in the Garden of Eden, and read the Scriptural documentation for it, see the Bible study, A Strange Thing: Mystery in the Garden.